AMIDST all the great pulp thrills and features in Sky Fighters, they ran a true story feature collected by Ace Williams wherein famous War Aces would tell actual true accounts of thrilling moments in their fighting lives! This time we have French flyer—Lieut. Maurice Boyau! Maurice Boyau was France’s fifth ranking ace. Fonck, Guynemyer, Nungesser and Madon, all ranked above him in actual victories scored. Maurice Boyau combined all the best qualities of these four aces and wan in addition the most ingenious. 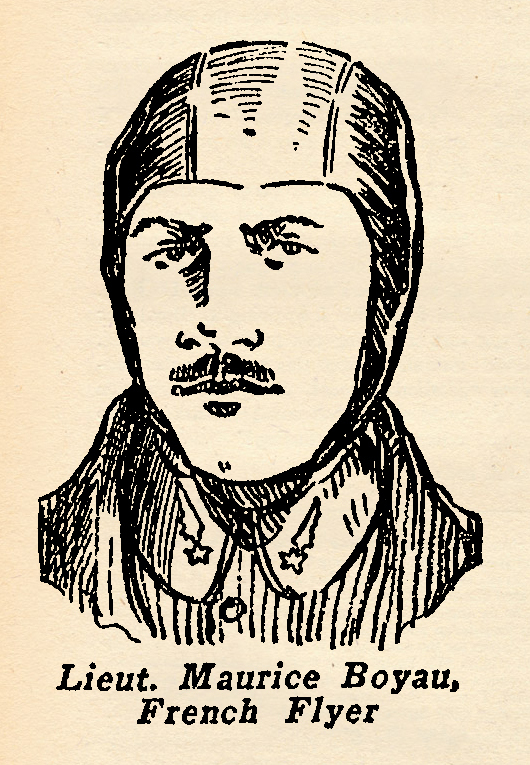 If death had not cut short his flaming career long before the war ended, it is very possible that he might have attained the honor of being France’s ace of aces, for he had every qualification for that distinction. He was struck down when he had run his 35 victories, but not before he had won every medal within the power of his native country to bestow. These Included the Legion d’Honneur, Medaille Militaire and the Croix da Guerre, with numerous stars and palms. The following story taken from his diary gives a striking and vivid example of his ingenuity. The translator has made no attempt to polish the language of Boyau’s script, feeling that to do so would take away from the charming simplicity of the document. DOWNING enemy avions is one thing. It requires a certain technique that one learns only by experience. I have much experience in such fighting up to date with considerable luck thrown in. But until today I had never challenged any Boche Drachens or the anti-aircraft crews ordered to guard them. In order to augment my battle experience I decided to tackle one of those big rubber cows which are much like a youngster’s carnival gas balloon of grotesque shape held with a string. I went out on a solitary balloon hunting expedition behind the Boche lines. But as was my usual habit before taking off I filled the side pocket of my petite Spad with hand grenades. These were mainly, of course, to destroy my own machine if I should be forced to land behind the enemy lines. Today I used them for a much different purpose, a most unusual purpose…. Allons! It is of no interest what I am writing. I should be specific, otherwise there is no point in keeping a diary. I proceed to the action. I flew for almost a full hour before finding what I set out for. Finally I spied one, just a grey, elongated dot in the blue and white sky, maybe ten kilometers ahead and to my right. I swing up on each wing alternately to search the sky lanes for hidden enemy aircraft. But I see none, so I straighten out and make for the area behind the Drachen. I hope to surprise by attacking from the rear in the glow of the sun. My strategy is successful, for I almost reach it in a silent dive with throttled motor before the crew sees me. The archies start firing and the puffs blow around me. I have my sights on the balloon though, and press my triggers. Sacre! My mitrailleuse! It jams with the first shot. I chandelle and try to clear, but it is useless. The breech is plugged tight. The archie shells puff like corn in a popper! Only the kernels are black instead of white. I struggle vainly. The Drachen begins to descend in swift, jerky movements. The winch on the ground is hauling it in. The archie fire intensifies, and I hear the flutter of machine-gun bullets from the ground as they sift through the fabric of my wings. I have come many kilometers into enemy skies and have spent a whole hour in search of this Drachen. To return in full defeat is unthinkable. Suddenly I think of my little souvenirs in the side pocket. The grenades! I pull one from the pocket and dive again through the hail of fire. Pinching the stick between my knees I pull the firing pin with one hand and toss the grenade with the other. But I miss by many meters! Two, three times I climb off, only to return and dive with the same trick. But each time I miss. And then I have only one grenade left. The Drachen is almost to the ground, and the gunfire is terrific. My poor petite Spad has been riddled like a sieve. I chandelle again, dive down for another attempt. But this time I hold my dive until my avion almost touches its nose to the quivering Drachen. At the last moment I pull back swiftly, kicking my tail down and hear nothing, feel nothing. But when I look back over my shoulder I see that I have slashed the Drachen with my tail skid. Some of the balloon netting is dangling from my skid and whipping backwards. I renverse swiftly, take my last grenade. As I sweep over the sliced balloon, it spreads apart like a cleaved sausage. I toss the grenade into the yawning chasm. Over my shoulder I see a burst of orange-red flame, then a blanket of smoke. The huge envelope fails over lazily in the sky and goes streaking down. It is my first balloon victory. And to think that I win it with jammed guns. C’est un miracle!